One of the newer books in the (never-ending) Discworld saga. I'm finding it extremely hard to say anything interesting about this book – not because it's bad, but it's a Discworld novel and …well that's it. It's no worse and no better than all the other Discworld novels. 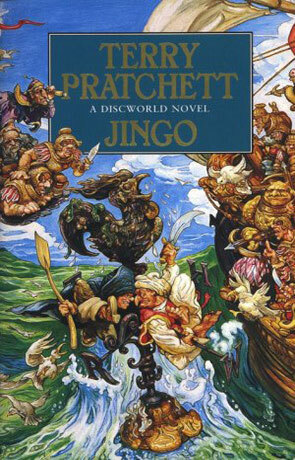 Pratchett is funny, as always, the characters are funny, as always, the story is as unimportant as always. The only thing that makes this book stand out a bit, is that it's the most political Discworld story I've ever read. The subject of the story is war and the similarities to Operation Desert Storm are kind of hard to miss. It's not exactly political satire, but Pratchett gets a few things in edgewise. When a lost city raises from the sea between Ankh-Morpork and the country of Klatch, war starts brewing as both countries lays claim to the lost treasure. But war is a crime and the Watch of Ankh-Morpork suddenly get really busy. Written on 1st March 1999 by TC.